By Adam Curry. Posted Sunday, July 22, 2012 at 12:12 PM. By Adam Curry. Posted Sunday, July 22, 2012 at 12:13 PM. Freefall Effect's message is simple and clear. Things are not as they seem and truth is not being disseminated to the masses. They hope that these tunes will shed some light on this simple truth and cause listeners to stop and think. Also, they are donating all proceeds to the No Agenda Show, a podcast hosted by former MTV VJ Adam Curry and tech columnist and former Tech TV host John C Dvorak. They feel that this podcast does the finest job of deconstructing the issues of today and the media's negative influence therein. Lots of improvements: + Beautiful artwork on radio streaming screen. > Includes calendar feature to see the stream schedule. 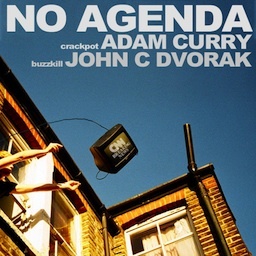 + Recent show screen to listen to 100 most recent No Agenda shows. > Recent show player features 30 second skip and 10 second rewind. + iCloud integration to save your position in a recorded episode so you can start where you left off when you listen on a different iOS device. (requires iOS 5.0 or greater) + Push notification to let you know when a new recorded episode is ready. + No Agenda News Network integration. + No Agenda Chat integration. > Chat with other No Agenda listeners and fans without leaving the app. AUSTIN KICK OFF PARTY "IN THE MORNING"
JAMES HOLMES, who opened fire before the midnight premiere of "The Dark Knight Rises," could not have seen the movie. Like many whose misery is reflected in violence, he may simply have been drawn to a highly publicized event with a big crowd. In cynical terms, he was seeking a publicity tie-in. He was like one of those goofballs waving in the background when a TV reporter does a stand-up at a big story. In response to the shooting rampage at a midnight screening of "Batman: The Dark Knight Rises" in Colorado, The National Association of Theater Owners said in a statement Friday that its members are now "working closely with local law enforcement agencies and reviewing security procedures." "A well regulated Militia, being necessary to the security of a free State, the right of the people to keep and bear Arms, shall not be infringed." -- The Second Amendment to the U.S. Constitution Does the Second Amendment prevent effective gun regulations? What is the "right to bear arms"? Second Amendment litigation has become a critical battleground since the U.S. Supreme Court held, in District of Columbia v. Heller, that the Amendment guarantees an individual right to possess a firearm in the home for self-defense. This decision created a radical shift in the meaning of the Second Amendment, but it doesn't prevent smart gun regulations. In fact, since Heller, courts nationwide have found a wide variety of firearms laws constitutional because they can help prevent gun deaths, injuries, and crimes in communities across the country. The United Nations is polishing up a global Arms Transfer Treaty (ATT) this month in a New York convention that would create a global registry of private ownership of firearms. This treaty -- which would also mandate creation of a national collection agency for those guns and is contrary to the U.S. Constitution's Second Amendment -- has the long-standing and enthusiastic backing of the Obama State Department, headed by Secretary of State Hillary Clinton. "Conventional arms transfers are a crucial national security concern for the United States, and we have always supported effective action to control the international transfer of arms," Hillary Clinton noted as early as October 14, 2009. Clinton boasted that "the United States regularly engages other states to raise their standards and to prohibit the transfer or transshipment of capabilities to rogue states, terrorist groups, and groups seeking to unsettle regions." Global norms for disarmament are vital to the sustainable development, quality of life, and ultimately the survival of this planet. The need for such norms arises directly from the legacy of the last century of wars and preparations for wars. The costs of such conflicts have been extraordinary and have included the loss of untold millions of innocent civilians. Weapons of mass destruction, along with excess stocks and illicit transfers of conventional arms, jeopardize international peace and security and other goals of the Charter of the United Nations. Are you ready for the next major global food crisis?- The price of corn hit an all-time record high on Thursday.- So did the price of soybeans.- The price of corn is up about 50 percent since the middle of last month, and the price of wheat has risen by about 50 percent over the past five weeks. On Thursday, corn for September delivery reached $8.166 per bushel, and many analysts believe that it could hit $10 a bushel before this crisis is over.- The worst drought in the United States in more than 50 years is projected to continue well into August, and more than 1,300 counties in the United States have been declared to be official natural disaster areas. So how is this crisis going to affect the average person on the street?- Well, most Americans and most Europeans are going to notice their grocery bills go up significantly over the coming months.- That will not be pleasant.- But in other areas of the world this crisis could mean the difference between life and death for some people. Last month the USDA announced People's Gardens. I'm sure that my thoughts on why this database will be questioned by the "anything having to do with gardening is great crowd," much like my post on Michelle Obama and the White House Garden was, but this just doesn't sit well with me. When the S510 Food Safety Act was being discussed, I thought it smelled a bit funny. I think this smells even worse. The headline that of the press release for the launch was, "USDA Launches Database for Public to Sign-up and Show their People's Gardens on Interactive Map; Promotes Access to Healthy Food, Sustainable Practices." The press release goes on to describe the program: With the opportunity for the people to enter their People's Gardens into the database, they will be able to describe each garden, identify who is involved¸ where it is located as well as attach photos and add the contact information for their partners. For those who start a People's Garden, they can ask to have a People's Garden sign shipped to them. To view the interactive People's Garden map and access the database, go to www.pubinfo.usda.gov/garden. The Battle of Damascus, also known as Operation Damascus Volcano for the rebels, started on 15 July 2012 during the Syrian uprising. It is unclear who started it. Per some reports thousands of rebels infiltrated the capital from the surrounding countryside while per others the military learned of the large-scale rebel operation beforehand and made a preemptive strike. to assess the country's weapons program, a US official with access to Syrian intelligence said. A major task for the CIA at this point, he told The Daily Beast, is to debrief defecting military officers to obtain as much information as possible-regarding Syria's weapons of mass destruction. The official said that it is also up to the intelligence agency to sort through caches of intercepted phone calls, emails and satellite images to find the exact locations of the Assad regime's chemical and biological weapons. Rep. Mike Rogers, the Republican chairman of the House Permanent Select Committee on Intelligence, would not comment on whether or not CIA officers had been sent to the region. However he said that the administration had recently deployed "the resources necessary to collect the information that we need to make a good decision on chemical and biological [weapons], opposition groups and leadership transition strategies." In september wordt in Nederland een bijeenkomst gehouden van de Friends of Syria. Dat is een werkgroep van ongeveer 50 landen, die zich zich bezighoudt met sancties. Dit heeft het ministerie van Buitenlandse Zaken vandaag laten weten. De Friends of Syria, waarin onder meer westerse en Arabische landen zitten, willen met sancties, steun aan de oppositie en humanitaire hulp een eind maken aan de burgeroorlog in Syrië. Het is voor het eerst dat de Friends of Syria in ons land vergaderen. Aan de bijeenkomst nemen vertegenwoordigers op hoog ambtelijk niveau van circa 50 landen deel. De Friends of Syria, waarin onder meer westerse en Arabische landen zitten, willen met sancties, steun aan de oppositie en humanitaire hulp een eind maken aan de burgeroorlog in Syrië. Firefighters in southeast Turkey on Saturday put out a fire on a pipeline carrying about a quarter of Iraq's oil exports, but it was unclear when oil would resume flowing, security sources said. They blamed sabotage by Kurdish separatists for the explosion on the Kirkuk-Ceyhan pipeline. The fire broke out at 11 p.m. (1700 EDT) on Friday near the town of Midyat in Mardin province, near the Syrian border. Officials blamed the attack on the Kurdistan Workers Party (PKK), a Kurdish separatist group that has claimed responsibility for past attacks on the 960-km (600-mile) pipeline. Avoiding pressure from the United States, Pakistan and Iran have committed to press ahead with the gas pipeline project and constituted a joint working committee to finalize a deal for laying Pakistan's portion of the pipeline by Tehran. Iran has agreed to form a Joint Working Group (JWG) to expedite the Iran-Pakistan Gas Pipeline Project, during a meeting of the Pakistan-Iran Joint Committee on oil, gas and energy, which was held on July 17-18 at Islamabad to discuss bilateral cooperation in the said sectors. Dr Ahmad Khalidi, Deputy Minister for Internal Affairs to Minister for Petroleum headed the Iranian team, and Abid Saeed, Additional Secretary, Ministry of Petroleum and Natural Resources headed the Pakistani team, reports The Dawn. The two sides discussed issues of mutual interest particularly the energy sector. The Iranian side expressed its intention to invest in the E and P sector including investment in the upstream and midstream. They also invited Pakistani companies to invest in E and P sector in Iran. The two sides decided to include experts from technical, legal, financial and commercial sectors in the JWG to work out the details with respect to the implementation of the Iran-Pakistan Gas Pipeline project. CAIRO (Reuters) - An explosion on Sunday rocked the Egyptian pipeline built to carry natural gas to Israel and Jordan, the 15th time it has been attacked since the start of the uprising in early 2011 that toppled President Hosni Mubarak. The blast occurred in the early hours of Sunday morning at al-Tuwail, east of the coastal Sinai town of al-Arish, at a point before the pipeline splits into separate branches to Israel and Jordan, security officials and witnesses said. Gunmen in a small truck drove up to the pipeline, dug a hole and placed explosive charges under the pipeline that they detonated from a distance, a security official and witnesses said. A large boom echoed across the area and residents up to 30 km (18 miles) away said later they could see flames of burning gas lighting the sky. An official in the company that manages the pipeline said exports of gas to both Israel and Jordan had been halted since an explosion that hit the pipeline in April and that the flames were caused by residual gas. Residents in al-Arish, however, said gas shipments had begun three days ago through the pipeline, which at one point supplied Israel with about 40 percent of its natural gas. Egypt in April terminated its agreement to supply gas to Israel because of what it said was a business dispute. The 20-year gas deal, signed in the Mubarak era, was unpopular with many Egyptians, with critics accusing Israel of not paying enough for the fuel. No group has claimed responsibility for the attacks on the installation that crosses the increasingly volatile Sinai Peninsula. Security in Sinai was relaxed after the fall of Mubarak as the police presence thinned out across Egypt. A top economist at the International Monetary Fund has poured scorn on its "tainted" leadership and said he is "ashamed" to have worked there. Peter Doyle said in a letter to the IMF executive board that he wanted to explain his resignation after 20 years. He writes of "incompetence", "failings" and "disastrous" appointments for the IMF's managing director, stretching back 10 years. No one from the Washington-based IMF was immediately available for comment. Mr Doyle, former adviser to the IMF's European Department, which is running the bailout programs for Greece, Portugal and Ireland, said the Fund's delay in warning about the urgency of the global financial crisis was a failure of the "first order". In the letter, dated 18 June and obtained by the US broadcaster CNN, Mr Doyle said the failings of IMF surveillance of the financial crisis "are, if anything, becoming more deeply entrenched". He writes: "This fact is most clear in regard to appointments for managing director which, over the past decade, have all-too-evidently been disastrous. "Even the current incumbent [Christine Lagarde] is tainted, as neither her gender, integrity, or elan can make up for the fundamental illegitimacy of the selection process." ATHENS, Greece (AP) -- Former U.S. President Bill Clinton is meeting with Greek Prime Minister Antonis Samaras to discuss foreign investment in Greece. Clinton is in Greece to promote the "Hellenic Initiative," an initiative by businessmen of Greek origin living abroad who want to facilitate foreign investment in the debt-ridden country and to raise $100 million to help charities active in Greece. Later, Clinton and Samaras will be joined by a team of Greek-American businessmen and Greece's foreign, defense, finance and development ministers. Clinton is scheduled to speak to a select audience of Greek-American businessmen and will depart Athens on Sunday afternoon. Toch een Griekse euro exit in september ? Zondag 22 juli is duidelijk geworden dat het Internationaal Monetair Fonds serieus overweegt om de hulp aan Griekenland stop te zetten. Dit blijkt uit een artikel van het Duitse weekblad Der Spiegel (hier te lezen). Als dit daadwerkelijk het geval is, zal Griekenland in september 2012 evengoed nog failliet gaan, ondanks alle inspanningen en noodfondsen. Zonder de hulp van het IMF zal Griekenland op korte termijn de rekeningen niet meer kunnen betalen. A global super-rich elite has exploited gaps in cross-border tax rules to hide an extraordinary �13 trillion ($21tn) of wealth offshore -- as much as the American and Japanese GDPs put together -- according to research commissioned by the campaign group Tax Justice Network. James Henry, former chief economist at consultancy McKinsey and an expert on tax havens, has compiled the most detailed estimates yet of the size of the offshore economy in a new report, The Price of Offshore Revisited, released exclusively to the Observer. He shows that at least �13tn -- perhaps up to �20tn -- has leaked out of scores of countries into secretive jurisdictions such as Switzerland and the Cayman Islands with the help of private banks, which vie to attract the assets of so-called high net-worth individuals. Their wealth is, as Henry puts it, "protected by a highly paid, industrious bevy of professional enablers in the private banking, legal, accounting and investment industries taking advantage of the increasingly borderless, frictionless global economy". According to Henry's research, the top 10 private banks, which include UBS and Credit Suisse in Switzerland, as well as the US investment bank Goldman Sachs, managed more than �4tn in 2010, a sharp rise from �1.5tn five years earlier. The detailed analysis in the report, compiled using data from a range of sources, including the Bank of International Settlements and the International Monetary Fund, suggests that for many developing countries the cumulative value of the capital that has flowed out of their economies since the 1970s would be more than enough to pay off their debts to the rest of the world. Defense Secretary Leon Panetta ordered senior Pentagon officials on Thursday to begin monitoring major U.S. news media for disclosures of classified information in an effort to stop the release of government secrets after a series of high-profile leaks. The announcement came hours after Panetta and other senior defense officials appeared before a closed-door hearing of the House of Representatives Armed Services Committee to discuss recent disclosures of classified security information. -Reports about U.S. cyber warfare against Iran, procedures for targeting militants with drones and a double agent who penetrated a militant group in Yemen have angered U.S. lawmakers. Some have charged the leaks were timed to benefit President Barack Obama's re-election bid. Representative Buck McKeon, the Republican chairman of the House panel, told a news conference later that he did not believe the Pentagon was behind the leaks and that Panetta and the other officials were taking the issue seriously. "Both the chairman and I were very convinced that Secretary Panetta and all of the folks at the Pentagon are taking it seriously, are trying to mitigate the damages and prevent it in the future," said Adam Smith, the top Democrat on the panel. UPDATE: "I want to reassure everyone (inc all sudden medical experts) that Mother is fine but is resting up in AZ on the orders of a doctor, not us," Jermaine Jackson tweeted Sunday morning. "This is our mother and her health is paramount. We are not inventing or plotting anything. We are following doctor's advice. Period." Katherine Jackson has been reported missing to the Los Angeles County Sheriff's Department after her grandchildren, Paris, Prince, and Blanket were unable to reach her all week, RadarOnline.com has confirmed. "I can confirm that a missing person's report was filed this evening by Mrs. Katherine Jackson's nephew, Trent Jackson, after he was unable to see her or reach her for a week. The report will be referred to the Homicide/Missing Persons Unit, and they will be handling the investigation," Lt. Josh Thai told RadarOnline.com exclusively. And a source close to the situation tells us exclusively, "The kids are being taken care of by their nanny. Paris is absolutely beside herself with worry. She lost her father three years ago, and not to know if her grandmother is ok is just more than she can bear." Jermaine and Randy Jackson are claiming their mother is with them and that they've had her examined by a doctor. That doctor is Allan Metzger, who testified for the defense during Dr. Conrad Murray's involuntary manslaughter trial, RadarOnline.com is exclusively reporting. The matriarch of the Jackson family "was recently examined by Dr. Allan Metzger. The visit was arranged by two sons, Jermaine and Randy Jackson. Katherine already has a doctor, but her sons insisted that she see Dr. Metzger," a source close to the situation tells RadarOnline.com exclusively. Former Saudi Ambassador to Washington Prince Bandar Bin Sultan replaces Prince Muqrin Bin Abdul Aziz as chief of intelligence also retaining the post of National Security Council head by royal decree. Prince Muqrin was appointed adviser and special adviser to the king with the rank of minister. Saudi authorities warned non-Muslim expatriates on Friday, the first day of Ramadan, not to eat, drink, or smoke in public until the end of the Muslim holy month's sunrise-to-sunset fast -- or face expulsion. The Interior Ministry of the oil-rich kingdom called on expatriates to "show consideration for feelings of Muslims" and "preserve the sacred Islamic rituals." Otherwise, a ministry statement said, Saudi authorities will cancel violators' work contracts and expel them. Saudi Arabia's population of 27 million includes some 8 million expatriates, including Asians, Arabs, and Westerners, according to government figures. On July 26, the U.S. Air National Guard will get the green light to begin firing lasers from unmanned attack drones in a vast swath of skies over North Dakota, despite the concerns of local commercial pilots. At the Devils Lake home of the North Dakota Army National Guard, pilots train on MQ-1 Predator drones -- the most prevalent unmanned attack vehicle in the military arsenal. In late June the Federal Aviation Administration (FAA) published an updated set of rules and regulations covering Devils Lake, creating several large restricted airspaces over the Camp Gilbert C. Grafton military base. The reason: the Air Force plans to begin tests of potentially dangerous lasers shot remotely from the drone. "Sorties will be limited to the minimum necessary for training, be confined to restricted airspace, and be executed against ground targets for laser designation, completely within an existing Army small arms weapons training range," Billie Jo Lorius, a public information officer with the North Dakota National Guard, told FoxNews.com. The lasers aren't intended as weapons, as were those built on the jumbo jet operated by the Air Force in the Airborne Laser Test Bed program, which was officially mothballed in February. Rather they are targeting lasers fixed on a spot on the ground, which can be used to steer other explosives to a target. The German federal prosecutor's office has opened a probe into the 2010 death of a German national in a drone strike in a Pakistan tribal district bordering Afghanistan, a spokesman said Thursday. Climate change could transform the Australian outback, wiping dozens of small towns off the map, according to a new report commissioned by the federal government. With many rural towns struggling to survive, climate change -- expected to make much of inland Australia hotter and drier -- could be the final straw, warns the report by the government's National Climate Change Adaptation Research Facility. Not only will the changes affect quality of life, with summer temperatures becoming insufferable, but they could make agriculture a marginal activity, thanks to more frequent and prolonged droughts. On June 27, the Intergovernmental Panel on Climate Change (IPCC) issued a statement saying it had "complete[d] the process of implementation of a set of recommendations issued in August 2010 by the InterAcademy Council (IAC), the group created by the world's science academies to provide advice to international bodies." Hidden behind this seemingly routine update on bureaucratic processes is an astonishing and entirely unreported story.- The IPCC is the world's most prominent source of alarmist predictions and claims about man-made global warming.- Its four reports (a fifth report is scheduled for release in various parts in 2013 and 2014) are cited by the Environmental Protection Agency (EPA) in the U.S. and by national academies of science around the world as "proof" that the global warming of the past five or so decades was both man-made and evidence of a mounting crisis. If the IPCC's reports were flawed, as a many global warming "skeptics" have long claimed, then the scientific footing of the man-made global warming movement -- the environmental movement's "mother of all environmental scares" -- is undermined.- The Obama administration's war on coal may be unnecessary.- Billions of dollars in subsidies to solar and wind may have been wasted.- Trillions of dollars of personal income may have been squandered worldwide in campaigns to "fix" a problem that didn't really exist. The "recommendations" issued by the IAC were not minor adjustments to a fundamentally sound scientific procedure.- Here are some of the findings of the IAC's 2010 report. The IAC reported that IPCC lead authors fail to give "due consideration ... to properly documented alternative views" (p. 20), fail to "provide detailed written responses to the most significant review issues identified by the Review Editors" (p. 21), and are not "consider[ing] review comments carefully and document[ing] their responses" (p. 22).- In plain English: the IPCC reports are not peer-reviewed. Nearly half of the claimed warming during the past century did not occur in the real world but is merely the creation of flawed data adjustments, reports a new paper presented at a meeting of the European Geosciences Union. Removing flawed adjustments to raw temperature readings shows the Earth warmed merely 0.42 degrees during the past century, rather than the 0.7 to 0.8 degrees claimed by the United Nations Intergovernmental Panel on Climate Change. Government analysts take raw data gathered from temperature stations around the world and adjust the temperature readings in several ways before releasing official temperature reports. Skeptics have long pointed out that the majority of the analysts are far from objective referees of the raw temperature data. Most are outspoken global warming alarmists who accumulate and retain large budgets, staff, and media attention only so long as a global warming crisis appears to exist. The European Geosciences Union paper points out the analysts routinely discard readings from temperature stations showing cooling temperatures and give unwarranted weight to readings from temperature stations showing warming temperatures. Moreover, they often adjust the data at individual temperature stations reporting cooling temperatures in a way that allows them to claim temperatures are actually rising at these stations. Meteorologist Anthony Watts has written an excellent summary of the paper after Marcel Crok first brought the paper to public attention. - Of the $988 million spent so far, a quarter went toward debt relief to unburden the hemisphere's poorest nation of repayments. But after Haiti's loans were paid off, the government began borrowing again: $657 million so far, largely for oil imports rather than development projects. - Less than 12 percent of the reconstruction money sent to Haiti after the earthquake has gone toward energy, shelter, ports or other infrastructure. At least a third, $329 million, went to projects that were awarded before the 2010 catastrophe and had little to do with the recovery - such as HIV/AIDS programs. - Half of the $1.8 billion the U.S. promised for rebuilding is still in the Treasury, its disbursement stymied by an understaffed U.S. Embassy in Port-au-Prince in the months after the quake and by a Haitian government that was barely functional for more than a year. - Despite State Department promises to keep spending public, some members of Congress and watchdogs say they aren't getting detailed information about how the millions are being spent, as dozens of contractors working for the U.S. government in Haiti leave a complex money trail. "The challenges were absolutely huge and although there was a huge amount of money pledged, the structures were not there for this to be done quickly," said former U.S. Ambassador Brian Curran. "The concept of build back better is a good one, but we were way over-optimistic about the pace we could do it." The U.S. Special Coordinator for Haiti Thomas C. Adams, who oversees USAID spending here, says the first priority in the critical days after the quake that killed more than 300,000 was crisis management, and the U.S. government spent $1.3 billion on critical rescue operations, saving untold lives. Three months later, the goals shifted from rescue to what would become a $1.8 billion reconstruction package aimed at building new foundations. "U.S. taxpayers, in the past, have spent billions of dollars in Haiti that haven't resulted in sustainable improvement in the lives of Haitians," said Adams. "The emphasis was never on `spend the money quickly.' The emphasis was on spending the money so that in a year or two, we could look at these projects and see that we've helped create a real base to jump-start economic development and give Haitian families and businesses the kind of opportunities they deserve." Haitian government officials are appreciative, and said the U.S. provides generous support for projects that impact long-term development. As for going back into debt, "Haiti needs all the assistance it can possibly get at this point," said Prime Minister Laurent Lamothe's deputy chief of staff Dimitri Nau. At least 21 people were burned with at least three sent to the hospital after they participated in a "firewalk" at a Tony Robbins self-help convention. The people who suffered various second-and third-degree burns were among more than 6,000 who attended an event Robbins billed as "Unleash the Power Within," reports The San Jose Mercury-News. The convention opened Thursday at the San Jose Convention Center, and attendees had the chance to walk across 10 feet of hot coals laid out in an adjacent park as they exited the building. "We discourage people from walking over hot coals," Fire Dept. Capt. Reggie Williams said.